Mantra for success – Success is your birth right not failure. You are born to succeed and evolve. Mantras for success will help you overcome obstacles and achieve your goals. Success is your birth right not failure. You are born to succeed and evolve. Mantras for success will help you overcome obstacles and achieve your goals. 1. The ones who could not succeed because of their inaction. 2. Those who out of jealousy do not wish that you succeed. Because of the duality principle of creation the negative forces of nature go side by side the positive forces. Due to the negative forces one may find at times obstacles blocking one’s path to success. Our ancient wise devised certain remedial measures for overcoming obstacles and Mantras are very prominent among these. Mantras were designed using appropriate Sanskrit language words with overall potent vibrations, which act as suggestion for the sub conscious mind to enable the conscious mind to act in the right direction. Some potent mantras for Success are given below. You can recite this mantra at any time as and when required. Recite this mantra in the morning and evening during the difficult times when you face obstacles and uncertainty in the path of success for wealth and progeny. (3) This Saraswati Devi mantra is especially for students for success in education of all kinds including various arts such as music, painting and acting etc. Recite in the mornings before sunrise as and when required. (4) The following Lord Shiva Mantra prays to Madhava; the source of supreme bliss with whose grace the dumb person can become expressive and the physically challenged can climb mountains. Recite this mantra at any time as and when needed in order to gain confidence for achieving success in any pursuit. 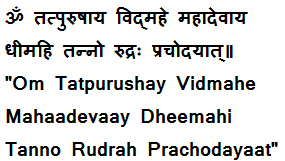 (5) The following Rudra Gayatri Mantra will provide protection and fulfil all desires. Recite it at any time as and when required. Recitation of Mantras: It is a fact that greater the number of recitations of a mantra greater the benefits. But one must recite with full concentration, faith and interest. By focussing on recitation numbers only and not getting pleasure out of recitation weakens the mantra. So put more importance on your faith, concentration and enthusiasm while reciting, even if you recite for just 108 times in one sitting. You can use a rosary of 108 beads for counting. A rosary is just for keeping a count so the beads can be of any material but must be smooth to feel.